When The Cows Don't Come Home : Talking Plants Blog If you happen to be a vegetarian, the news that a farmer's been losing money on his cattle and has decided to sell them is a good thing. The equation's very simple: fewer cows, fewer cows slaughtered. If you happen to be a vegetarian, the news that a farmer's been losing money on his cattle and has decided to sell them is a good thing. The equation's very simple: fewer cows, fewer cows slaughtered. But watching farmer Dave Burt nurse his lame bull and pick corn for his favorite Braunvieh cows -- knowing he was days away from selling his entire herd -- my heart broke for him much the same way it might have if he was about to lose his favorite dog. 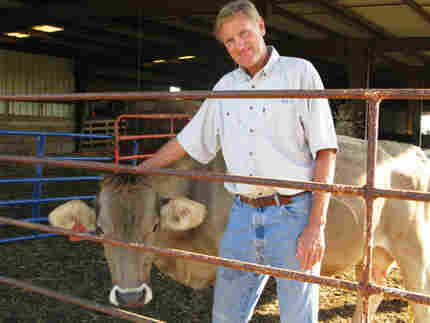 "I guess you'd call them my therapy," he said describing his relationship with his cattle. Having spent a few days with him observing that most of his time is spent behind the wheel of one noisy vehicle or another, I take his point. The quietest and most contemplative part of his working day has clearly been among his cattle, listening to them mooo and graze and watching them nuzzle. 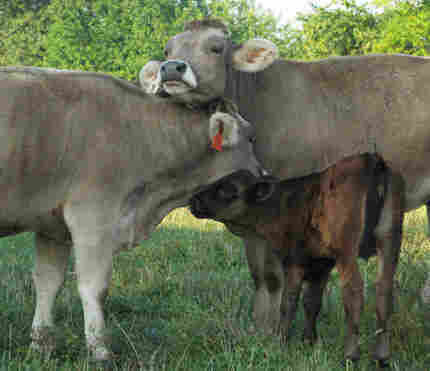 (These Braunvieh are so incredibly affectionate!). In case you haven't heard the Morning Edition feature on Dave Burt, the reason he's giving up his cattle is because raising them has become unprofitable. His costs have doubled and tripled over the last few years, while cattle prices haven't budged. Except recently, that is. Now they're plummeting. It appears he got out just in time -- not an entire surprise, since successful 21st century farmers like Burt are as skilled at playing the market as they are about feeding the cows. Dave Burt worries about the availability of meat should more and more small farmers his age (he's 56) decide their cattle aren't worth the work. 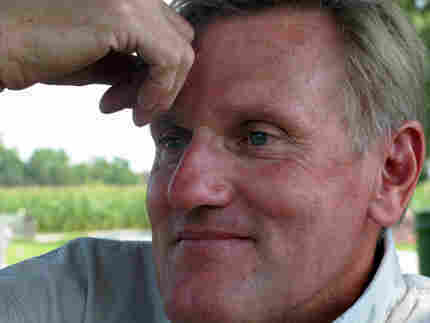 If his own 50 and 60-something colleagues are any indication, a whole lot of farmers are poised to give them up. Incidentally, the real cash cow on Burt Farms is agriculture: corn, wheat, soybeans, sunflowers. So lucrative (she says, tongue firmly planted in cheek), that at the current market price for these commodities, Dave Burt will lose a quarter-million dollars next year if his seed, fertilizer and fuel costs are what they are today.